Mission: Joya: arte + ecología is a non profit artist and writers’ residency in the heart of the Parque Natural Sierra María-Los Vélez in rural southern Almería, Spain. We aim to facilitate artists, writers and researchers across disciplines who wish to engage rigorously in the discourse of the place, and changes to our culture and environment. 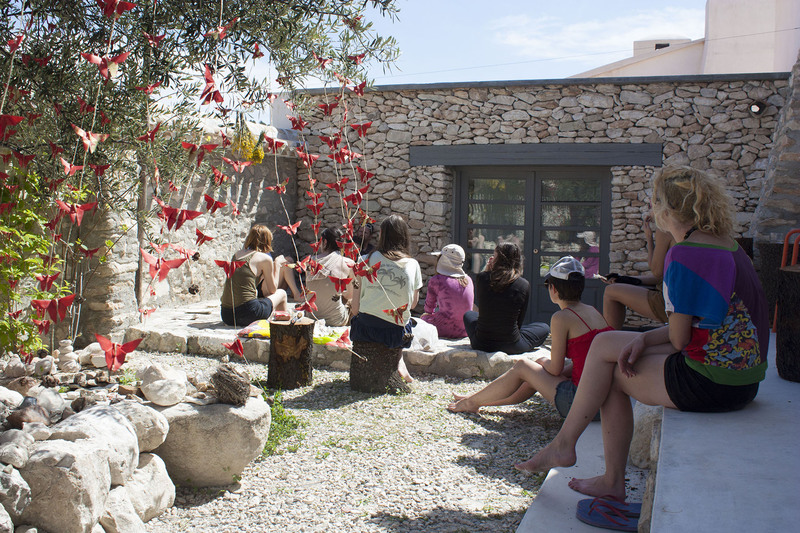 Curated residencies: In the last five years the organization has invited and hosted in excess of 600 artists at Joya: arte + ecología, providing them with a studio environment free from distraction in one of Spain’s most beautiful regions. Group residencies: We annually host group residencies with MA students in Fine Art. So far, groups have come from The University of the Arts, London (Camberwell, Chelsea and Wimbledon), The Slade School of Art and Aberystwyth School of Art. In 2013, we hosted students from Goldsmiths University, The University of Granada and the University of Bedfordshire. Awards: Our first award was AGUAZERO requesting submissions to reference the contrary character of climate change. The second was LUZ: light reactions, seeking proposals for multimedia work that evidences light dependent reactions upon the environment. With the aid of a sponsor, we fund the travel expenses of our award recipient in tandem with funding their residency. The third award was ¡TOMA!, requesting proposals for works which sustainably utilise natural material found within the rain water catchment system described in Joya: arte + ecología’s project Sistemas Efímeros. Keep an eye out on our website for future awards and funded residencies. 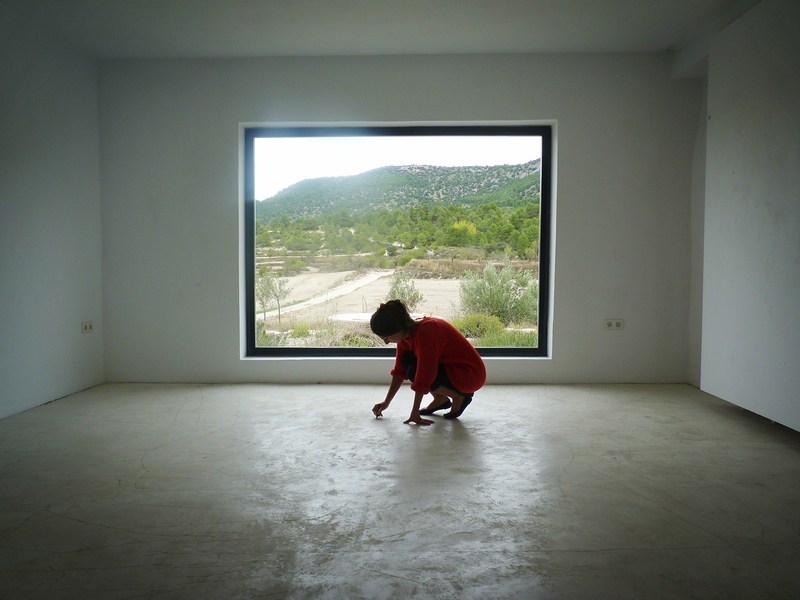 Curation: We curate work from our resident artists and others at venues across Spain. In 2012, we curated ecoarttech at CAC Málaga (Centro de Arte Contemporáneo de Málaga). Our most recent project, in August 2016, was Double Self Split: an exhibition crossing ties between the castle in Vélez Blanco, and the Metropolitan Museum in NYC with New York artist Melissa Marks. Projects: We are beginning to initiate large projects such as Sistemas Efímeros. The aim is to unite trans-disciplinary skills to investigate sustainable means of restoring and producing water resources and attributing value to marginalized land in a transportable model to other similar ecosystems internationally. The residency is based at Los Gázquez, the home of Joya: arte + ecología, at a 1000m in the alpine desert of southern Spain. The house was once a cluster of five homes nestled in the mountains amongst the almond groves and pine forests. It is now a new vernacular space that is 85% carbon neutral making power from the sun, the wind and biomass. All waste-water is re-cycled through reed beds and the farm practices permaculture techniques to grow food. Residents have a large internal studio at their disposal as well as 20 hectares of land. They also have their own private rooms with attached bathroom. This is an extremely quiet rural location with no light pollution at night. Accommodations: Los Gázquez, the home of Joya: arte + ecología, was once five old farmhouses, a cortijada being the plural of cortijo, the Andalucían name for a farm. It is now converted into a single very beautiful space. On the one hand great homage and respect has been given in its restoration to the simple vernacular architecture of the building, and on the other hand a crisp eye for detail has been employed which makes the place seem stunningly modern. The interior has uncomplicated luxury with minimal design. The sitting room is sixteen meters long with a large library of art books at your disposal as well as lots of comfortable places to curl up. 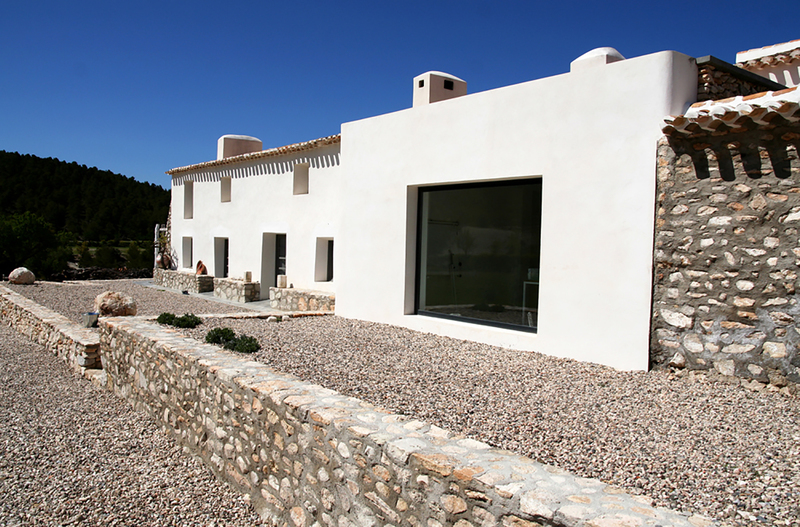 The cortijada has under floor heating throughout maintaining beautiful warm winter temperatures. Each bedroom has an attached bathroom each with a generous shower area. The bedrooms are at the front of the building, the bathrooms to the rear. This allows for gentle cross ventilation in summer. Our mattresses are deep and comfortable. The only sounds in the silence of night are the hoots of owls. And there is no light pollution so the night sky is full of stars. 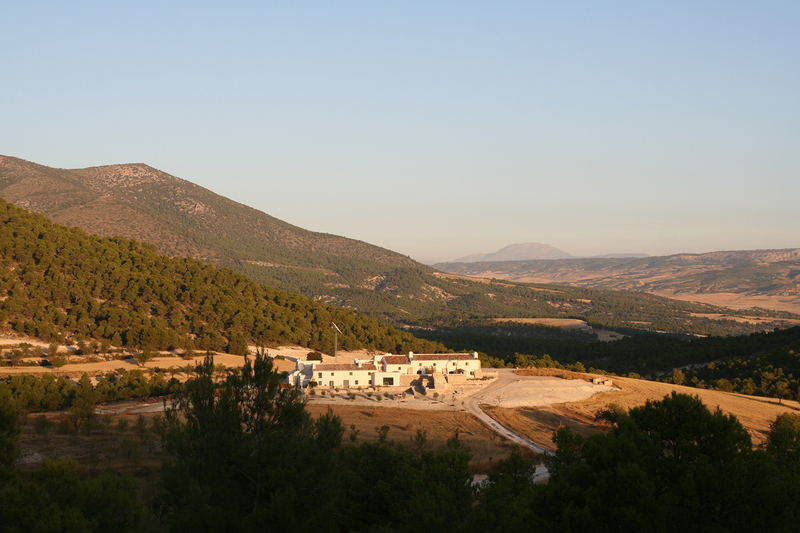 Cortijada Los Gázquez is also a ‘carbon neutral’ guesthouse sitting in a valley of almond and pine. Heat and light from the sun, thermal winds and wood from the land combine in a system of solar panels, wind turbines and fires to cook and create energy. Rainwater is harvested from the roof. Waste-water is managed and utilized through a system of reed beds and a grey water recovery system is used to irrigate the dry land. A week at Los Gázquez, as opposed to a conventional guesthouse of the same size, in the same climatic area, will offset the carbon emissions from a flight from northern Europe. In other words we produce 15% of the carbon emissions from Los Gázquez than an equally sized building using mainstream energy systems. This Cortijada sits benignly in the mountains and when you look aloft to the Golden Eagles in the sky, living at the apex of the food chain, you can be confident that your stay here will no more effect the natural ecology other than to serve it. We have limited Wi-Fi available. Demographic/Medium: We welcome artists of all ages. Disciplines include: Drawing, Painting, Sculpture, Installation, New Media, Photography, Filmmaking, Landscape studies, Geography, Climatology, Performance, etc. Benefits: Artists will have sole use of a 30 m2 studio and 20 hectares of land. Accommodation and meals are included as is collection and return to the nearest public transport system. Resident artists will be featured on the Joya web page, which will include biographical information and images. The work undertaken during the residency will also be documented and entered into our archive. Resident artists might be required to open their studio to Los Gázquez’s creative guests and talk with them about the issues that concern their work and their experiences as professional artists. On completion of the residency artists will be asked to donate a small piece of the work they have created during the residency to the Joya project. 1. Firstly to be in an unspoilt rural environment far from distraction but in an atmosphere of like minded creatives and environmental scientists. 2. Secondly, to benefit from the publicity and opportunities Joya: arte + ecología can extend to those artists who share, augment and pursue the objectives of our organization. We publish all artist in online and press materials associated with our residency, and encourage artists to give presentations on their work apon the completion of their residency. Posted in Joya: arte + ecología, SpainTagged accomodation included, AGUAZERO, AlhóndigaBilbao, alpine desert, Anadalucía, Art, art residency, artist in residence, artists, Awards, ¡TOMA!, biomass, carbon neutral, climate change, climatology, collaboration, Cortijada Los Gázquez, curated residencies, Drawing, ecoarttech, ecosystems, Environment, filmmaking, geography, group residencies, International, Joya, Joya: arte + ecología, land, landscape studies, Library, light dependent, Los Gázquez, LUZ, MA students in Fine Art, manifests, marginalized land, meal, meals included, natural material, New Media, old farmhouses, open studios, Painting, Parque Natural Sierra María-Los Véléz, Performance, permaculture, Photography, production, Provincia de Almería, residencies, residency, rural, Sculpture, Sistemas Efímeros, solar power, southern Spain, Spain, Studio, sustainability, waste-water recycle system, water resources, wind powerBookmark the permalink.